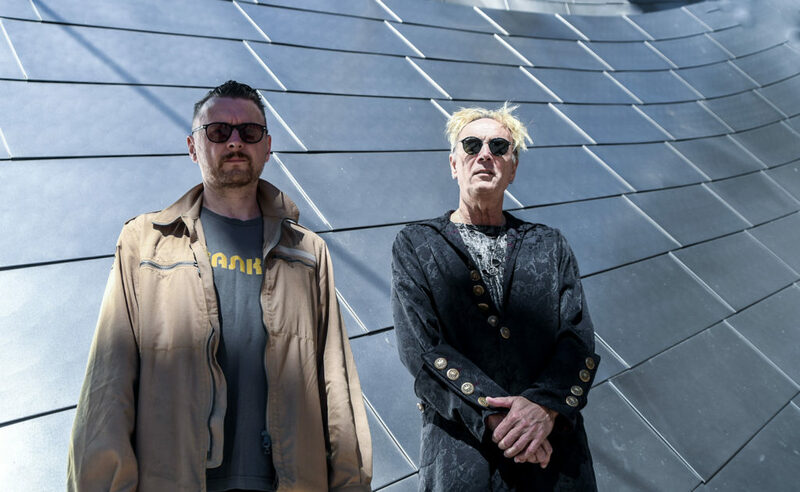 Vancouver-based industrial legends Front Line Assembly have returned with a full-length album, Wake Up The Coma. Featuring several guest artists, including D.A.F.’s Robert Gorl and Jimmy Urine of Mindless Self-Indulgence on an unforgettable cover of Falco’s “Rock Me Amadeus,” it’s an impressive and memorable addition to their extensive 30-year discography. Wake Up The Coma showcases Leeb’s lyrical and vocal style perfectly as well as his uncanny ability to surround himself with such talent, including-of course- longtime member Rhys Fulber, whose solo album and performances at Cold Waves Festival this year were also incredibly innovative. In this interview, Rhys Fulber talks Wax Trax, gear, and collaboration. I think the first burning question for everybody is, what inspired the Falco cover? (For the record, I love it!) And how did you get Jimmy Urine on board, what was the connection there? This was something Bill had been talking about for a little while, maybe to reflect on his Viennese roots, and also just for fun. We are not particularly dour people in person so we thought it would be nice to loosen it up a bit and have fun with something. I have worked in the studio a lot with Jimmy, mixing the last two MSI albums and his latest solo effort as well, so we had a solid working relationship as well as personal, and he just seemed like the perfect fit for this. In fact i can’t think of anyone else who could have pulled it off. We spent a bunch of time in my studio trying to get the german at least passable! It was a nice change for FLA in my opinion. You guys have moved so seamlessly from a sort of ambient style in the AirMech and WarMech soundtracks, to bringing back a more danceable vibe on this album with songs like “Eye On You” and “Structures.” It’s one of the things I’ve always loved about FLA…that versatility. How much of the EBM/techno feel on “Wake Up The Coma” do you think is your influence versus Bill? I say this because your solo album is so club-friendly and I hear a lot of FLA elements in it. I think we just found a middle ground. I added some of those vibes but i also respect that Bill likes to keep moving forward and not try and recreate energy from a long time ago. Also, vocally I think the style we found suits Bill’s voice much better than a shouty EBM approach. Also the Warmech team of Jared, Sasha and Craig contributed a lot of ideas musically to bridge the gap from Echogenetic to this album. The list of collaborators on this album is pretty impressive. I’m assuming FLA and Chris Connelly go way back to Wax Trax days, but what about Robert Gorl of DAF and Nick Holmes on the title track…how did that come about? We actually only met Chris on the Revco tour we did a couple years back, but got along great and thought it would be cool try something different. We of course half expected the Bowiesque take he gave us and were very happy with it. Nick has been a friend of mine for a while now (I worked on several Paradise Lost records), and I am a fan of his voice. The thing with Robert was to set up Bill, and then he just sent us some synth parts we assembled into the piece on the album. I know we talked gear a little at Cold Waves this past year and I remember you saying something about not really needing a lot of fancy gear to make music, which I think is solid advice in an era where it’s become trendy to spend thousands on modular synths. How has FLA’s gear list evolved over the years and what do you think is the most valuable tool in the studio? Well I can only speak about my set up, but it hasn’t changed much over the years. The same big boutique polysynths, a few nords and a revolving cast of eurorack modules. I also have a decent amount of outboard gear and preamps to add that warmth when recording. The most valuable tool is of course the computer, but thats not fun to hear about, so the synth that gets used the most on FLA is the Studio Electronics Omega 8. Getting back to Wax Trax, I’ve been asking everybody this, but what did you think of the Industrial Accident documentary? I thought it was good. We didn’t live in Chicago in that era so we were more on the periphery of that scene but it seemed to tell the whole tale in an interesting way. What are some newer industrial/EBM acts that you find interesting and exciting right now? I like my Berlin crew of friends like Sarin and Blush Response and I also really like Terence Fixmer and Schwefelgelb. I feel the european techno version of EBM is carrying the torch more accurately from its avant-garde club roots.